Detox diets and cleansing supplements are all the rage right now. Why? Because people enjoy the state of wellbeing they feel when they purify their bodies from the inside out. So what if there were a way to purify at an even deeper level? Like so deep it could cleanse your spirit. According to Swedenborg we can remove toxic elements, not just from the tissues of our bodies, but from the thoughts and impulses of our spirits so the Lord’s Divine love and wisdom can easily pass through us. In this episode of Swedenborg and Life, host Curtis Childs and featured guests review Swedenborg’s written philosophies on removing spiritual toxins like materialism and self-centered actions so we can all follow a clear path to Heaven. 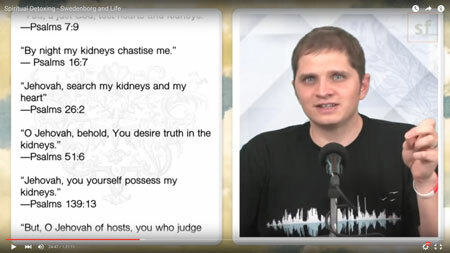 Curtis kicks off the first segment with an excerpt from Secrets of Heaven about our inner selves and outer selves to help viewers understand the distinct ways Swedenborg defines them. 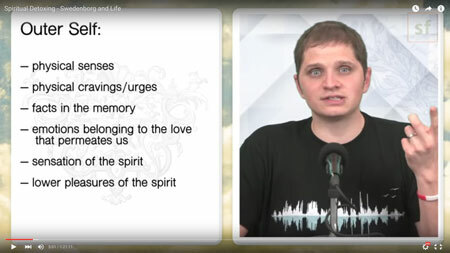 He further breaks it down by presenting a helpful list of the characteristics of our outer selves that Swedenborg says are in need of spiritual cleansing. 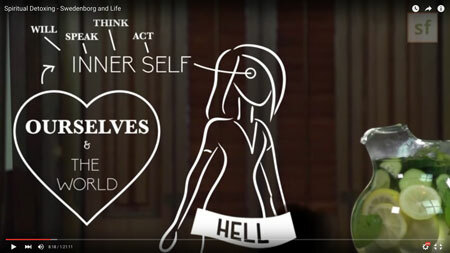 This animated verse from Swedenborg’s True Christianity shows the connectedness and oneness between the physical and spiritual worlds—the inner self and outer self with heaven and hell. Many faith traditions include doctrine about the importance of being pure of sin and accepting of God to enter the pearly white gates of Heaven—and they range in extremes depending on the religion. Swedenborg had a moderate interpretation of how pure and accepting a person has to be to get into Heaven. Swedenborg believed that spiritual cleansing is a gradual process that starts on earth and continues in the afterlife—he says that even angels in Heaven are not perfect and still have work to do through a purifications process he calls shatterings. Curtis introduces a series of excerpts from Secrets of Heaven that describe why it’s important to remove self-centeredness, self-love, and self-pride through shatterings. In addition to these negative qualities, Swedenborg explains that we must also remove falsity from our minds to be spiritually clean. Curtis reads an excerpt from Secrets of Heaven that explains the difference between evil falsity and ignorant falsity, and how the two are treated in the afterlife. 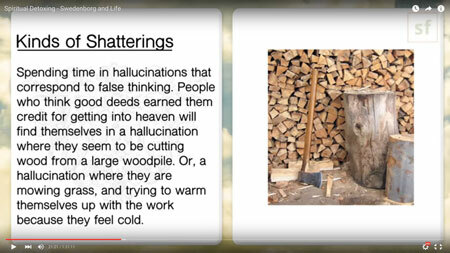 Swedenborg even describes the different types of shatterings we might experience in the afterlife depending on which toxins need to be removed from our spirits. This does not mean that the afterlife should be feared. Rather, the afterlife provides even more opportunity than we had on earth to purify ourselves and receive God’s grace. The Bible mentions kidneys. A lot. We tapped our resident Bible expert and Series Editor of the New Century Edition of the Works of Emanuel Swedenborg, Dr. Jonathan Rose, to find out why kidneys come up so much in the Bible. He explains that the Bible often used concrete expressions to describe spiritual or inward processes. Swedenborg says that kidneys, which are used to purify the life-giving blood in our bodies, are referenced in the Bible in a spiritual sense to describe the cleansing and filtering of our thoughts and actions. So if our spiritual kidneys keep us mentally and emotionally healthy, what happens if they become blocked or lose function? 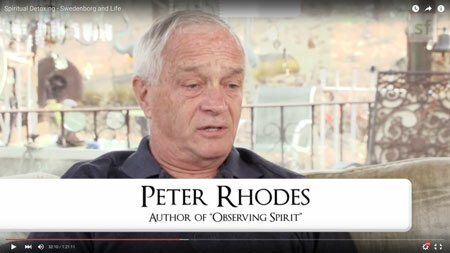 Peter Rhodes, author of Observing Spirit, joins the discussion to explain how negativity can start to pervade our lives when our spiritual filters break down. In Peter’s personal experience, addiction arose from his self-centered mentality. To strengthen his spirit to fight the addiction, Peter explains how he had to hit rock bottom to even begin to start the process of recovering physically and spiritually. This spiritual process of regeneration and renewal is very similar to the physical process the kidneys go through in the human body. Assistant professor of biology and chemistry Dr. Edwards Higgins joins the conversation to provide a brief overview of our renal system’s ability to process and remove toxins from our blood while still keeping the vital and nutritious elements our bodies need to survive and function. Similarly, our minds work to process our thoughts—keepings the good and discarding the bad—as long as our mental/spiritual state is functioning properly. Curtis introduces a series of excerpts from Swedenborg’s unpublished Journal of Spiritual Experiences to present Swedenborg’s unique concept about spirits who are tasked with the job of acting as mental kidneys to help filter people’s thoughts. It may seem odd, but the point is we’re never alone in our journey towards Heaven. We’re being guided by God and those who’ve gone before us to help us remove negative qualities and embrace positive attributes so we’re prepared to enjoy eternal peace and joy in the afterlife. Physically and spiritually speaking, systems are in place to ensure our health. If we don’t use the systems, physical and spiritual structures can break down. Take exercising, for example. Do it and you can enjoy optimal health benefits. Don’t do it and you risk deteriorating physical conditions. Swedenborg says, if we were not offered a support system for self-reflection, we would remain in our own illusions and never have a chance to prepare for Heaven. Since we do have this system at our disposal, we’re able to learn what is good and true—and live by it. 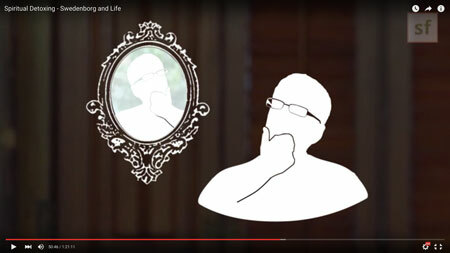 In this animated clip, Swedenborg describes a spiritual experience he had about the gift of self-reflection. 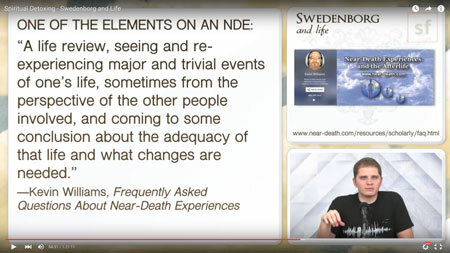 The gift of self-reflection is also seen in accounts of near-death experiences as shown in this excerpt from an expert on NDEs. It’s great that people are able to have spiritual experiences to show them the way, but how can we find our spiritual reflection here and now? An interesting answer may lie in the medical diagnostic testing for the cause of anatomical kidney stones, as described by Dr. Higgins. If we can find the “why” of a negative situation, we have a chance of solving the problem. The Bible makes several references to the washing of feet. Our inner selves are already inherently connected to God. Our outer selves need cleaning to receive Divine love and wisdom without interference. That’s why the washing of feet in the Bible is so symbolic to Swedenborg. Our special guest Chelsea Odhner joins to explain how spiritual practices keep the path between our inner and outer selves clean. When Jesus washed Simon Peter’s feet in John 13:4–17, it represented the Lord’s humility and ability to wash away our spiritual faults like dirt. Swedenborg asserts this passage proves that our faults can be purified into strengths. Think of the ways you’ve learned from past missteps. Maybe your heart has softened a bit; maybe your understanding of life or other people has become a little deeper. Can you see spiritual refining process at work in your life? Do evil spirits attack us physically and mentally during the time of detox to keep us in their power, or is the Lord testing us before accepting us in heaven? So if God knows everything about us and crafted us all so that we somehow correspond with genetics, are we treated differently than others would be in situations due to mistakes of our family? Is it possible that there is one dream experience plane in which multiple realities interact but have trouble understanding each other? Can a spirit who was your soul mate in life be attached to you in spirit and always be around you? Has Swedenborg ever written anything about ghosts? Is the pain of grief a spiritual journey? Can evil spirits physically possess us? Did Swedenborg ever talk about the story of David and Goliath? I’ve seen some writings on the internet that link Swedenborg to Spiritualism, is that true? If I was married twice who would I be with in heaven? Suppose none of them was the best fit?